Ford stalwart Fred Gibson has identified the two-door Falcon as his favourite from the model’s five decade history in Australian motor racing. Gibson drove the Falcon to its maiden Bathurst victory in 1967 with Harry Firth before later becoming a team owner which saw him field the famous ‘green eyed monster’ AU Falcon for Craig Lowndes in 2001. However, Gibson, who also enjoyed success as a team boss with the Nissan GT-R in the Group A era, says the two-door Falcons of the 1970s are his favourites. 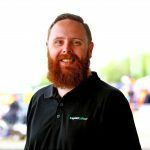 “I suppose really, it’s hard to say because it’s a different era,” Gibson told Speedcafe.com. “You start in ’67 and you go through to whatever. “I suppose the Falcon of ’67 was a great car to drive because it was probably one of the best road cars around. “To have a V8 and a manual, the whole thing, it was a lot different to what they are now for sure, but probably the best Ford we ever had was the two door Falcon we raced for Ford Motor Company. Gibson gives the two-door his vote over something like the Phase III owing to its all round capabilities that, in his opinion, elevate it to a better race car. “The Phase III Falcon never had the right sized wheels on it to get the job done properly with the horsepower they had and all those sort of things, with the brakes and everything,” he explained. “Whereas the two-door Falcon having disc brakes all around and (to) be able to put the big wide tyres on it with the mud guards they had on the body, that was a great car to drive. 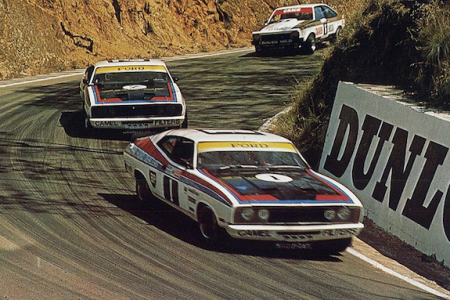 A two-door XA Falcon GT won Bathurst in 1973 with Moffat and Ian Geoghegan before John Goss and Kevin Bartlett won in a privately entered example the following year. The following model, the XB, was used by Moffat to claim the 1976 Australian Touring Car Championship, upgrading to an XC as he claimed the title the following year along with a famous one-two finish at Bathurst for the car. Ford ceased production of the two-door Falcon with the introduction of the XD in March 1979.